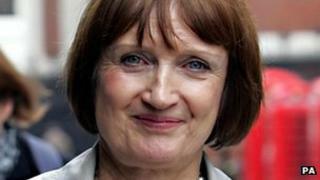 London MP Tessa Jowell has stood down from her post as the shadow Olympics minister. The MP for Dulwich and West Norwood said: "After 10 years with the Olympics and Paralympics it is job done." Labour leader Ed Miliband said: "Her legacy is enormous". Sports minister Hugh Robertson said the MP "laid the foundations for a successful Games". Dame Tessa was the Olympics minister when London won the bid to host the Games in 2005. The former social worker has represented the south London constituency since 1992 and was both Olympics minister and culture secretary in the previous Labour government. The MP, who was made a dame in the Queen's Birthday honours, said: "It has been the greatest privilege to have served as part of Labour's frontbench team, in government and most recently in the shadow cabinet, for nearly 20 years. "To have been able to be part of planning and delivering the Olympic and Paralympic Games from start to finish is a rare opportunity in public life and that too has been a privilege. "Our country has changed this summer and for the better because of the power of the British people, the Gamesmakers and our great Olympic and Paralympic athletes." Mr Miliband said Dame Tessa has been an "amazing asset to the Labour Party" and she "will be missed in the shadow cabinet". "What we have seen at the London 2012 would not have been possible without Tessa's determination and dedication both in championing the bid and playing a major role in delivering the Games," he said. "For this the whole country owes her a huge debt of gratitude." Sports minister Hugh Robertson said: "I'd like to pay tribute to Tessa's excellent work on the Olympic and Paralympic Games. "Not only did she play a vital role in the winning bid team but she laid the foundations for a successful Games. "I was pleased that, with the cross-party approach to the Games, Tessa continued to be involved throughout, with a position on the Olympic Board and as deputy mayor of the Athletes' Village during the Olympic Games."